How Can I Get Military Tuition Assistance? Are you interested in getting a college degree? It could help you achieve your goals in civilian life and even advance your career within the military if you’re still serving. Have you thought about using military tuition assistance? * Those programs were set up to help military personnel to get ahead through higher education, so it’s good to find out what’s available. There’s military tuition assistance if you’re on active duty, if you’re a reservist or in the National Guard, or if you’re a veteran. You can start getting your degree at any stage of your military career. There are many different programs available if you’re still on active duty, so check below to see which benefit or benefits apply to you. Military Tuition Discounts: Active duty service members can qualify to get discounted tuition. This also applies to reservists and National Guard members. Likewise, you can receive discounts if you’re working for the Department of Veterans Affairs or the Department of Defense. Chapter 33 - Post 9/11 GI Bill: This can actually pay for up to 100% of your tuition and other fees. To qualify, you must have served for a minimum of 90 days of active duty after September 11, 2001. You can also qualify if you were discharged because of a disability related to military service after 30 consecutive days on active duty. Chapter 30 - Montgomery GI Bill: This is a benefit fund you can pay into while you’re on active duty to build up tuition assistance for later, which can help pay for some of your tuition and fees. 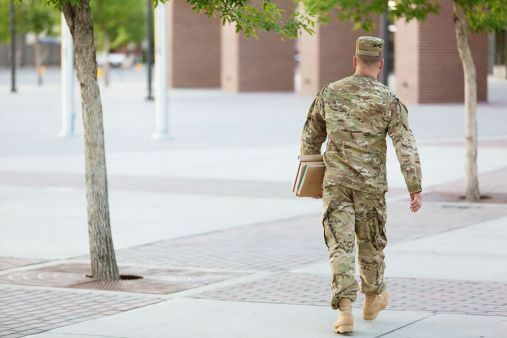 When you receive the benefit, you’ll be paid directly, so you’ll need to pay your own bill through your university’s military financial planner. Top Up: This can pay for an amount you still owe on tuition after other military tuition assistance has been applied. This assumes you qualify for the GI Bill and other requirements for tuition assistance. Chapter 1606 - Selective Reserve Montgomery GI Bill: If you’re a member of the National Guard or Selective Reserve, you enlisted or re-enlisted on or after July 1, 1985, and you committed to six or more years, Chapter 1606 will benefit you. It’ll pay you directly, and you can apply the funds to your tuition. Chapter 1607 - Reserve Educational Assistance Program (REAP): This helps National Guard members and reservists who served at least 90 cumulative days after September 11, 2001, because of national emergency or war. REAP will pay you directly, rather than paying your university. Kickers and Additional Contributions: When you enlisted, you might have been offered kickers as part of your contract. While you are receiving Chapter 30 or 1606 payments, your kicker amounts will be added to your monthly payments. After your time in the military is over and you become a veteran, a college degree can really help you compete in the job market. Military tuition assistance can help you pay for up to 100% of your tuition and fees. Also, you may be able to earn college credits by transferring classes you already took or transferring your military experience. You might find you’ve finished up to 75% of a degree that way! See below for other benefit programs. Chapter 33 - Post 9/11 GI Bill: See the discussion of this benefit in the previous section, as it’s mostly the same for veterans. The only difference for veterans is you can qualify only if you received an honorable discharge. Chapter 30 - Montgomery GI Bill: This benefit is explained in the previous section. But veterans qualify only when they have received an honorable discharge. Veterans Educational Assistance Program (VEAP): This is a program that you might have contributed to out of your military paycheck. If you did, the government will match what you paid at a rate of 2-for-1, as long as you received an honorable discharge and use VEAP within 10 years of being discharged. Yellow Ribbon Program: If you are 100% eligible for Chapter 33 but your tuition and fees are higher than the yearly amount covered by Chapter 33, the Yellow Ribbon Program can help. It’ll pay half of your tuition and fees that are left after Chapter 33 has paid. Chapter 31 - Vocational Rehabilitation: You can use this benefit if you go to a Vocational Rehabilitation Counselor. He or she will help you make an education plan, and then Chapter 31 can pay for up to 100% of your tuition and fees. A military spouse sacrifices a lot while his or her spouse is away on active duty. If you are a military spouse, or in the military looking at benefits for your spouse in regard to obtaining a degree, look through the benefits below. Tuition Assistance for Military Spouses: You might be eligible for a discounted tuition if your spouse is on active duty in any branch of the U.S. military or is serving as a reservist or National Guard member. Military Spouse Career Advancement Accounts (MyCAA) Program: This benefit can supply you with up to $4,000 toward an Associate’s degree or a certificate program—and up to $2,000 per DoD fiscal year. You can qualify if your spouse is on active duty. Transfer of Education Benefit (TEB) Post 9/11 Bill to Dependents: This benefit can pay up to $19,198.31 toward your tuition and fees per fiscal year if your spouse qualifies for Chapter 33 (discussed in a previous section above) and decides to transfer his or her benefits to you. Or it can be used for your dependent children. Fry Scholarship: This can help a lot with your tuition—or it can help your child or children. It transfers Chapter 33 benefits to the dependents of military personnel who died during active duty after September 10, 2001. Chapter 35 - Survivor and Dependents Assistance: This benefit helps pay tuition for spouses and other dependents of veterans who were disabled in the military—or of those who died during active duty. It will pay the benefit directly to the recipient, not the university. Are Online Degree Programs Right for You? Online programs are excellent while you’re deployed because you can take them from anywhere. They’re also good for veterans; when you are discharged, you might not want to go back to school and sit in a classroom. You might be working and only have time to take online classes. Here are the steps you’ll go through to apply: Military Application: First, contact Independence University and let us know you want more information for military personnel or veterans. A military admissions consultant will get back to you to help you get all the benefits you’re entitled to and help you with your enrollment application. Transcripts: As long as you tell us your service unit and where you’ve gone to school before, we can find your transcripts for you—including paying any fees to get them. With those, we can find out if any of your previous class credits or military experience can be transferred to complete part of your degree program for you. Meet with Your Financial Planner: Over the phone, you’ll meet with an experienced military financial planner. He or she will make financial aid easier to understand and help you make a plan to pay for the degree program you want. He or she will also help you through any applications you need, keeping track of all the forms. Meet with the Director of Admissions: You’ll have an interview with the Director of Admissions of the university. That individual should approve your enrollment. Then, your admissions consultant and financial planner will guide you in starting your classes and will be ready to help you with whatever you need. Request information about degree programs from Independence University. Tell us you need information for a military application, and a military admissions consultant will contact you as soon as possible. *Here, military tuition assistance is a general term referring to all educational benefits available through the military, not to be confused with Military Tuition Assistance, a specific benefit available to active duty service members.